Undeterred by the steady drizzle and grey skies two women departed for their walk from Prince Rupert to Prince George, video and story. Jun. 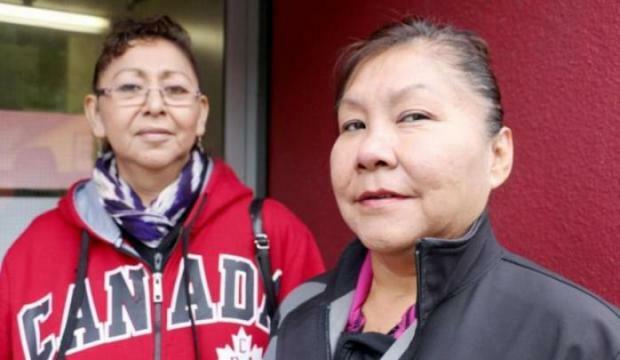 8, 2016 7:00 a.m.
Shannon Lough / The Northern View Angelina Chalifoux and Brenda Wilson started the 700-kilometre walk from Prince Rupert to Prince George to draw recognition to the missing and murdered women on Highway 16. Undeterred by the steady drizzle and grey skies two women departed for their walk from Prince Rupert to Prince George. Brenda Wilson and Angelina Chalifoux are covering the 700 kilometre distance along Highway 16 over the next three weeks, and meeting other friends and family along the way. They’re calling it the “cleansing the highway” walk. “The reason we’ve called it that is so that we can bring recognition and awareness to the many missing and murdered women along Highway 16,” Wilson said on June 2 at the Friendship House, minutes before her departure. Ten years ago another First Nations woman, Gladys Radek, also took the trek along what has become known as the “highway of tears” for the more than 30 women who have gone missing or have been killed along Highway 16. Wilson’s sister, Ramona, went missing from Smithers more than two decades ago. Her sister was only 16-years-old at the time, and in 1995 her body was found, the case of her death remains unsolved. Chalifoux walks for family member Aielah Saric-Auger, who was only 14-years-old when she went missing in 2006. Her body was found on Highway 16 and her case is also unsolved. “The government is starting to recognized that the families need to be involved and with this project we want the families to be involved on this walk so they have this opportunity to talk about their loved ones,” Wilson said. The walk is expected to conclude on June 21, National Aboriginal Day.